And then the talk started. –What are your impressions of each other? Let’s start with your thoughts on Ishihara-san. Yamada: Since I sit near him at the KyoAni studios, I see that he loves cameras, always looks like he’s enjoying himself, and wears shirts that look like children’s pajamas. (laughs) Recently he’s been so busy he looks cool. –What are your thoughts on Director Takemoto? Ishihara: His sense of balance is amazing. He’s able to not only balance his sense as a director, he also keeps production on schedule easily. Yamada: When I was a key animator, I wasn’t affected very much by scary things. Thus as we were working on the final episode of TSR, he handed me about a mountain of rough key frames and layouts and said “these aren’t good enough,” and made me re-do them all. If Takemoto-san hadn’t judged my work so harshly, I wouldn’t have worked as frantically as I did to improve. (laugh) Also the visuals for “Super Driver” (The 2009 Haruhi Suzumiya opening) was so cool. Oh, the first opening for Nichijou was also cool; it’s one of the highlights in recent years. –What are your thoughts on Director Yamada? Takemoto: She attracts a lot of people around her. Ishihara: There’s always a lot of people around her desk. Takemoto: The other day you got a lot of presents on your birthday. I was so jealous…. (laughs) When I say it’s my birthday, people just say “no it’s not” and we go back to work. In Yamada’s case, they say “It is? !” and their eyes light up. I’m really jealous. Yamada: I might think about not saying anything so they wouldn’t do that at my next job…..
–How do you decide what to name your characters? Ishihara: (Points at MC) That’s your job isn’t it?! (laughs) Nishioka-san is the editor in charge of the original work. For my case, I’ll think about it over and over until I think too much on it. –What do you two (Takemoto/Yamada) think about Chuunibyou? –What were some difficulties upon inserting original aspects into anime that weren’t present in the original work? 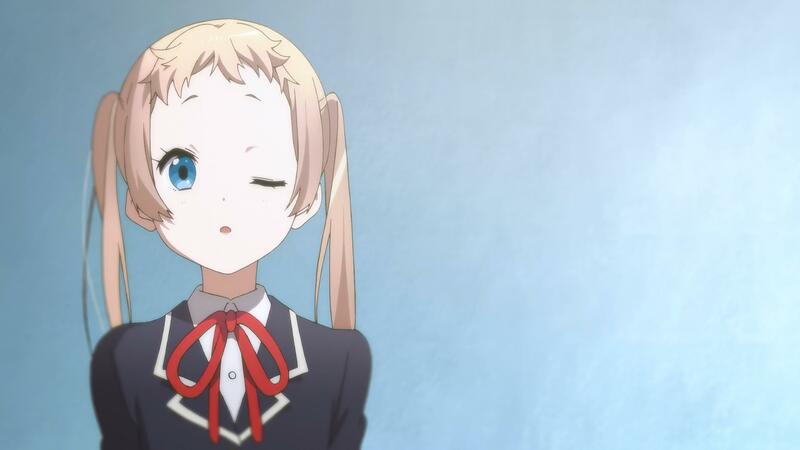 Ishihara: (regarding Chuunibyou) I inserted original aspects because I felt there wasn’t enough characters since we didn’t even have a full volume of material to work with at that time. Thus, making the anime was convenient for me; there weren’t really any troublesome portions. For Kumin-sempai, I wanted an ordinary person, but she ended up somewhat weird. (laughs) Dekomori was (Jukki) Hanada-san’s idea. Her saying “death” was one of the first things we decided, so it was easy for her too. –Are there any characters you have a strong emotional attachment to in a work you didn’t direct? Yamada: Free!’s Gou-chan is the cutest ever. I absolutely love her. Her long skirt, her perfectly fitting uniform, her somewhat thin ponytail…. She just looks cute. She’s not just girlish too; she’s got some boyish traits in her as well. Like her hair color is the same as her onii-chan’s. Takemoto: Utsumi-san talked with me one time saying “Takemoto-san…. I’m worried that Yamada-san and (Taichi) Ogawa-kum love Gou-chan too much!’ (laughs) You let your love of Gou-chan show way too much. (laughs) (Director Utsumi-san wanted you to) Enjoy drawing the guys instead! Ishihara: Utsumi-san directed episode 5 of Chuunibyou and an episode of Hyouka. I don’t think that anyone else would have drawn Houtarou’s (Oreki from Hyouka) rear with as much vigor as she did. (laughs) Women have a fainter drawing stroke, so when I saw that the storyboards for episode 5 of Chuunibyou were so thin during the school swimsuit scene, I had her re-do it. Yamada: However she continues to draw muscles as much as she wants until she’s pleased with how they look. –Takemoto-san, who’s your favorite character? Ishihara: So you’d like someone like Sousuke? –Who is your favorite character, Ishihara-san? Ishihara: The person who did Fuko’s transformation scene was the director of Kyoukai no Kanata, (Taichi) Ishidate-kun. –We received a lot of questions relating to the towns modeled in our shows. The four shows on display today were located in the Kansai region, specifically in the Kinki region. What do you think the charm of each of those towns and the region is? Ishihara: We’re not particular that shows have to be modeled here. Kanon was modeled in Sapporo. 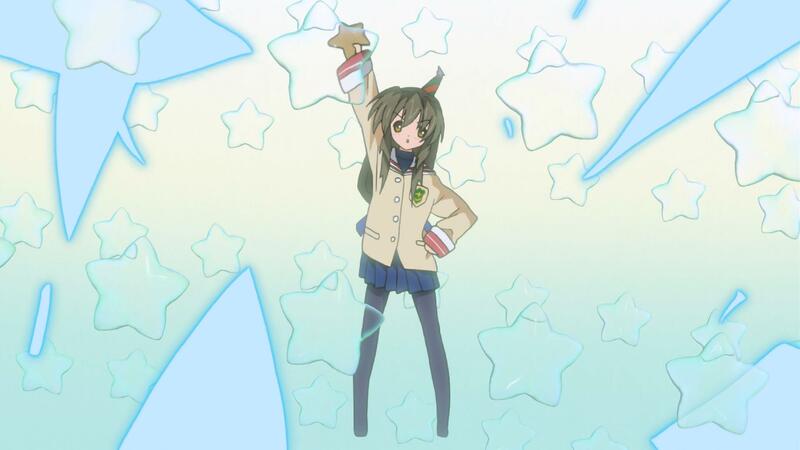 Clannad took place around the Yokota region and in Aoimori. 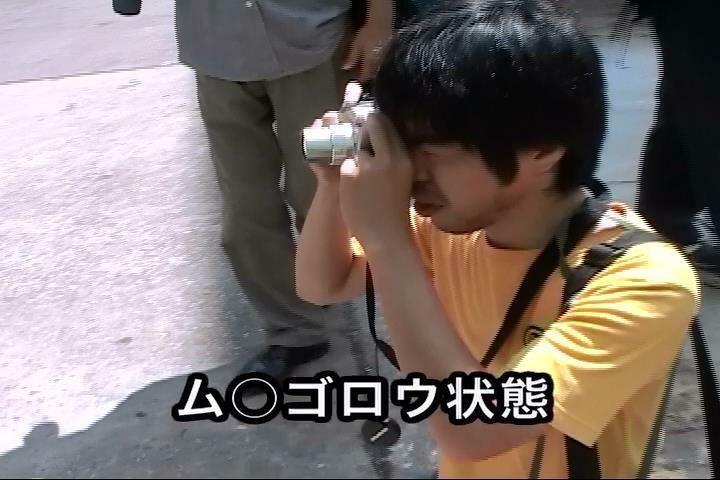 Yamada: Ishihara-san went with me to scout it for K-On! The Movie!. (Asks the crowd if anyone’s been to London. A few people raise their hands.) There’s a lot of rich people here! (laughs) I really really love music, so I was a bit overwhelmed by going to a holy land where my favorite bands and musicians were from. Ishihara: Why did we go to London again…..? Ishihara: (laughs) I guess it was because it’s the birthplace of British Rock and the Beatles. Yamada: Right. The cool badge you see on Ishihara-san’s flat cap is a gift I got when I went to a film festival in Scotland. I bought a cross that I think Rikka would like. I have so many good memories there. Ishihara: During location scouting we went to Stonehenge and other places we didn’t end up using. We also went to Windsor Castle. Yamada: We went to a lot of live music clubs. Those were fantastic experiences. Ishihara: We had conceptualized where the girls would go and what tourist locations they wouldn’t visit. Yamada: Right. By going there, we were able to feel how impressive this stone paving was, how cute the windows were shaped, how cute this candy’s colored and such. We restrained ourselves a little from going to all the locations we wanted to go, but as the story progressed, we were able to think about the trip from the girls’ perspective. Ishihara: We basically use it to give a reference for locations we may use. –Today we have a special guest joining us. 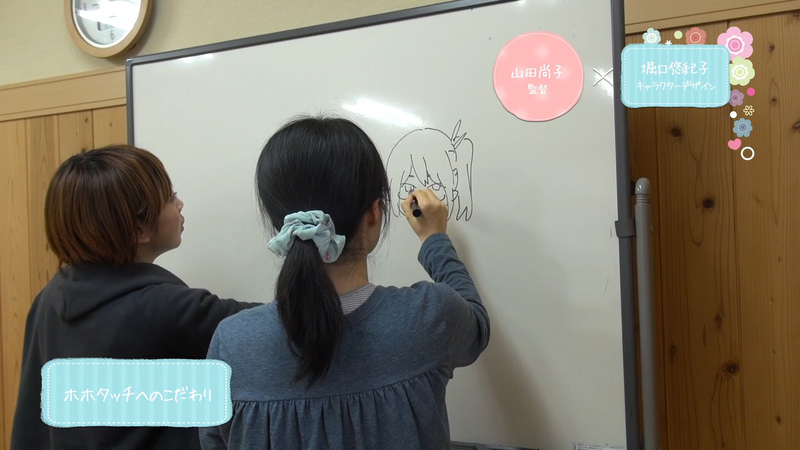 Please welcome the chief animation director for Tamako Market, Yukiko Horiguchi! –There’s an announcement coming soon regarding the new Tamako Market production, but we received a lot of questions about it from the fans. Director Yamada, can you tell us what story it’ll be about and how the phrase “Everybody Loves Somebody” affects it? Also, is this the love Tamako feels towards everyone or is it towards a certain person? Yamada: There’s a lot of things I can’t say, but the “love” part of “Everyone Loves Somebody” is definitely strengthened. Up until now we’ve depicted everyone around Tamako, so this time I wanted to depict Tamako herself. For that, Horiguchi-san and myself have powered up Tamako. Horiguchi: There’s various plans in progress for her. Horiguchi: There’s some minor changes that people may not notice…. Yamada: There’s no reason to change them if people don’t notice them! (laughs) You’ll unconsciously sense them. Horiguchi: I’m sad we had to change the designs, but the movie will definitely…. –Our time is nearly up, so this is the final question. What about working as a director makes you proud? Ishihara: Making something good in this line of work affects children that’ll love it when they see it for the first time and remember it later. I think the works that affected me will still be around after I pass on. Takemoto: I’m happy and grateful for the opportunity to show my work to many people. Those responses encourage me to keep going and make me think I did a good job. Horiguchi: Works that’ll be around after I move on. Working with this staff to complete something makes me feel happy. Yamada: Um… when making something… um…. (after thinking about it for a moment when Horiguchi was about to say something, she forgot what she was going to say) Ah, I got it. I’m not great at putting my thoughts into words, but when making anime I want to tell a story that’ll match the medium. I’m grateful for this way to tell something. When someone tells me how they were moved by something I made, it makes me so happy and happy that I was able to participate in making it. I want to make many more works and study how to spread them through many more ways of representing the story so that it could touch everyone’s hearts. -Our time is up. 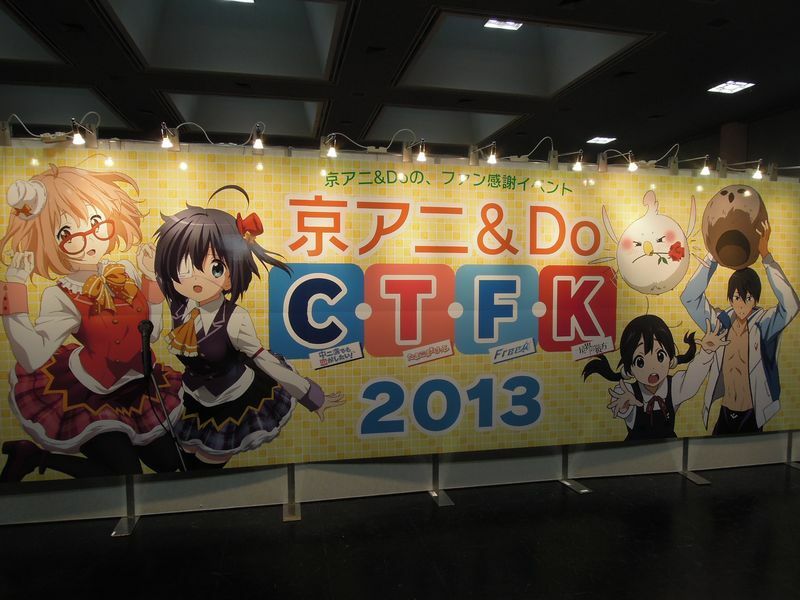 Thank you all for coming to the first talk event of the CTFK 2013 event, Directors’ Dialogue! This entry was posted in Chuunibyou Demo Koi ga Shitai!, Clannad, FREE!, Hyouka, K-On!, Kyoto Animation, Suzumiya Haruhi, Tamako Market, Translations and tagged CTFK, Dialogue, Directors', event, ishihara, stage, takemoto, Translation, yamada. Bookmark the permalink. Thank you as always for translating these. I love finding out more about KyoAni and especially their directors.